CRISPR-Cas9 gene-editing complex from Streptococcus pyogenes. Researchers at the Harvard Medical School have developed a new method for detecting unwanted DNA breaks across the entire genome of human cells induced by the popular gene-editing tools called CRISPR-Cas RNA-guided nucleases. Members of the same team that first described these off-target effects in human cells describe their new platform, called GUIDE-seq (Genome-wide Unbiased Identification of Double-stranded breaks Evaluated by Sequencing) in a report published in Nature Biotechnology. 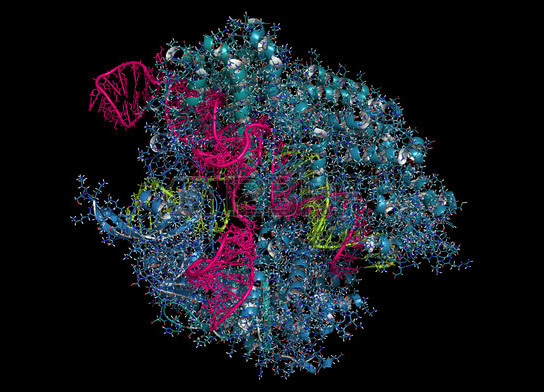 Used to cut through a double strand of DNA in order to introduce genetic changes, CRISPR-Cas RNA-guided nucleases combine a bacterial gene-cutting enzyme called Cas9 with a short RNA segment that matches and binds to the target DNA sequence. In a 2013 Nature Biotechnology paper, Joung and his colleagues reported finding that CRISPR-Cas RNA-guided nucleases could also induce double-strand breaks at sites with significant differences from the target site, including mismatches of as many as five nucleotides. Because such off-target mutations could potentially lead to adverse effects, including cancer, the ability to identify and eventually minimize unwanted double-strand breaks would be essential to the safe clinical use of these RNA-guided nucleases, the authors noted. The method they developed involves using short, double-stranded oligonucleotides that are taken up by double-strand breaks in a cell’s DNA, acting as markers of off-target breaks caused by the use of CRISPR-Cas. Those tags allow the identification and subsequent sequencing of those genomic regions, pinpointing the location of off-target mutations. Experiments with GUIDE-seq showed it was sensitive enough to detect off-target sites at which CRISPR RNA-guided nucleases induced unwanted mutations of a gene that occur with a frequency of as little as 0.1 percent in a population of cells. These experiments also revealed that no easy rules would predict the number or location of off-target double-strand breaks, since many such mutations took place at sites quite dissimilar from the targeted site. Two existing tools, designed to predict off-target mutations by analysis of the target sequence, were much less effective than GUIDE-seq in predicting confirmed off-target sites and also misidentified sites that did not prove to have been cut by the enzyme. Comparing GUIDE-seq with a tool called ChIP-seq, which identifies sites where proteins bind to a DNA strand, confirmed that ChIP-seq does not provide a robust method for identifying CRISPR-Cas-induced double-strand breaks. GUIDE-seq was also able to identify breakpoint hotspots in control cell lines that were not induced to express the CRISPR RNA-guided nucleases. In addition, GUIDE-seq was able to verify that their approach for improving the accuracy of CRISPR-Cas by shortening the guiding RNA segment reduced the number of double-strand breaks throughout the genome. Joung also expects that GUIDE-seq will be useful in identifying off-target breaks induced by other gene-editing tools. Along with pursuing that possibility, Joung noted the importance of investigating the incidence and detection of off-target mutations in human cells not altered to create cell lines—a process that transforms them into immortalized cancer cells. Understanding the range and number of off-target mutations in untransformed cells will give a better picture of how CRISPR-Cas RNA-guided nucleases and other tools would function in clinical applications. “The GUIDE-seq method is very straightforward to perform, and we intend to make the software for analyzing sequencing data available online to noncommercial researchers at www.jounglab.org/guideseq in the near future,” adds Joung. A patent application covering the GUIDE-seq technology has been filed. Support for the study includes National Institutes of Health (NIH) Director’s Pioneer Award DP1 GM105378; NIH grants R01 GM088040, R01 AR063070 and F32 GM105189; the Jim and Ann Orr Massachusetts General Hospital Research Scholar Award; and Defense Advanced Research Project Agency grant W911NF-11-2-0056. Be the first to comment on "New Method for Detecting Unwanted DNA Breaks in Human Cells"